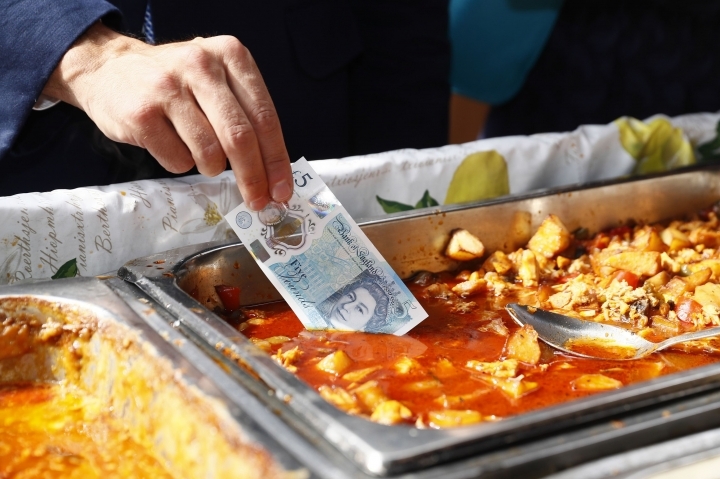 LONDON — The British pound fell sharply Tuesday after official figures showed that inflation in the country held steady in August, a surprise development for many in the markets who had been expecting a further pick-up in the wake of the country's decision to leave the European Union. The Office for National Statistics said that cheaper prices for food and non-alcoholic drinks helped to offset an increase in transport costs, notably air fares, and restaurant and hotel bills. The unchanged consumer prices index proved a jolt to many, evidenced by the 1.1 percent fall in the pound to $1.3195. The consensus in markets was that inflation would edge up for the third month running to 0.7 percent partly because of the dramatic fall in the pound to 31-year lows below $1.30 following June's vote to leave the EU. A lower pound makes imports, from oil to copper that are priced in dollars, more expensive. "Raw material costs have risen for the second month running, partly due to the falling value of the pound, though there is little sign of this feeding through to consumer prices yet," said Mike Prestwood, head of inflation at the statistics agency. Analysts said some firms may have chosen to absorb their higher costs but that over time they will have little option other than to pass them on, which could push inflation up towards the Bank of England's target of 2 percent in the coming months. "Over the next few months existing inventories will be wound down, and currency hedges put in place by supermarkets and other importers will gradually start to fall out of the equation," said Ben Brettell, senior economist at Hargreaves Lansdown. "It is only then that the full impact will be seen." The Bank of England, which on Tuesday unveiled a new plastic 5-pound note that depicts wartime leader Winston Churchill, is fully aware of the potential uptick to inflation but has opted to focus more on the softer growth outlook in light of the Brexit vote. As a result, it enacted another stimulus last month, including cutting its main interest rate to a record low of 0.25 percent. Though there's been a run of economic data that suggest that the initial impact of the vote may not have been as bad as many forecasters had been predicting, there are still huge uncertainties surrounding the outlook for the British economy, especially its future trading relationship with the EU. Still, given the recent signals coming out of the economy, the Bank's policymaking panel is expected to keep rates unchanged at its next meeting on Thursday. "It could probably afford to cut rates even further if required — though current conditions of slow, but not negative, growth do not create any urgent need to do so," said Alasdair Cavalla, senior economist at the Centre for Economics and Business Research.